Envisions a nation where museums and libraries work together to transform the lives of individuals and communities. The plan identifies the mission of IMLS to advance, support, and empower America’s museums, libraries, and related organizations through grantmaking, research, and policy development. With this strategic plan, IMLS has a roadmap for priorities and investment for the next five years. It targets four strategic goals, focusing on promoting lifelong learning, building capacity, increasing public access, and achieving excellence as a public agency. 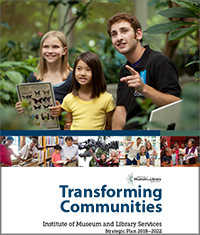 Transforming Communities: IMLS Strategic Plan, 2018–2022 (PDF, 4.59MB). The brochure provides an overview of the agency mission, vision, goals, and objectives, and includes highlights of IMLS initiatives and projects.